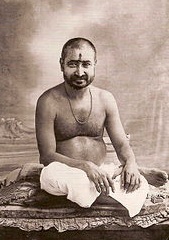 The fourth type of devotion is "Service to the Guru". The Guru's feet should be worshipped. Serve the Guru in order to be released from birth and death. It is the Sadguru who knows the Reality. That which is not seen by the eyes, and which is not apparent, is achieved because of the blessing of the Guru. Such states of consciousness as non-attachment, surrender, being beyond the body, being beyond the mind, and being in a natural state of complete indifference, are all attained only by the blessing of the Guru. The names are different, but the state is One. If one of these states is attained, all are attained. Non-attachment is to give up the sense of "mine", as well as name and form. There is nobody else capable of forgiving such as the Guru, who is motherly. If you totally depend on the Guru, you will attain God. The devotees should serve at the feet of the Guru. Verification of what we learn should be threefold, the confirmation through the teaching of the Guru, confirmation through the teaching of the scriptures, and verification through one's own experience. The attainment of the "Knowledge of Brahman" is dependent upon oneself, but without the Sadguru, you do not get real contentment. By study only, you will not get that which is learned troth the words of the Guru. That which is unattainable becomes possible to attain, only by the "Grace of the Guru". The attainment of the Absolute Reality, Parabrahman, is not possible without the company of Saints. This is the sign of the fourth type of devotion. The fifth type of devotion is "Worship" (archan).The various Gods are really Gurus who have existed in the past. All of the temples are of these Gods. How can we build a temple to Him who us greater than the world? The "Man of Knowledge" (jnani), the wise man, is God. The body of the wise man, the form that he bears as his body, is itself an image of Knowledge, an idol of wisdom. He is divine wisdom incarnate. That is the "Knowledge" possessed by the Sadguru, yet the Sadguru is different from these. So long as you have not met the Sadguru, you can only worship the past Gurus, the ancient men of wisdom. However, when one does meet Him, "devotion to the Sadguru" should be done with one's physical body, speech, and mind. Devotion to the Sadguru is the highest action we can do unto our Self. This is the best action that we can do for our own welfare, the action that makes all achievement and contentment possible. All other actions only become useless, and perish. The sixth type of devotion is "To Bow Down" (Vandanam). One should bow down to God, and to the Sadguru. By bowing down, blemishes in our character go away, blessings are given, and the Sadguru is pleased. By bowing, you gain humility and happiness, and by this happiness, you achieve a state where there is no animosity, only Bliss.